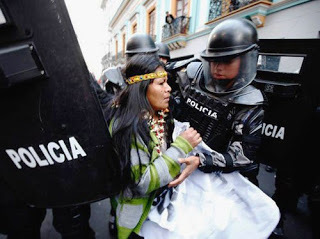 Cancelled by the Correa government in 2013, the Yasuni initiative is still one of the most inspiring social proposal to step out from extractivism and a call for the whole world to "yasunize" our territories. The Yasuni National Park is located between the Provinces of Orellana and Pastaza and it's been declared by UNESCO a World Biosphere Reserve for its biodiversity. It covers a large part of Ecuadorian Amazonia and it is home to one of the highest levels of biodiversity in the world, as well as indigenous non-contacted communities. 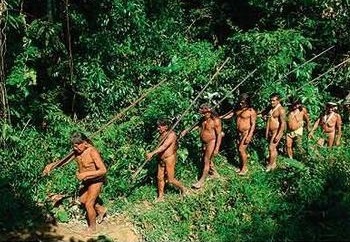 The Park includes in fact the ancestral territory of the indigenous Waorani, Kichwas, Shuar, as well as the Tagaeri, and Taromenane people, who make up the last two known indigenous groups living in voluntary isolation in Ecuador. The Ecuadorian Amazon area has been historically divided into oil exploration blocks so that local administrations could ideally grant oil extraction licenses for limited areas. The Yasuni park is divided into six different lots (blocks 14, 15,16,17,31 and ITT) with as many as eight oil concessions. Despite strong opposition from local communities, oil companies such as Repsol, OXY-Occidental Petroleum and Encana have been exploiting oil reserves in blocks 14, 15, 16 and 17 for years. In 2007, the Ecuadorian Government proposed to leave an estimated 850 million barrels of oil reserves in the ITT block untapped, while receiving compensation for 50 percent of the foregone revenue by asking donations or selling government bonds to Northern countries worldwide. The initiative of leaving oil in the soil to avoid carbon dioxide emissions and also to safeguard indigenous rights, and to conserve biodiversity, came originally from Oilwatch and Accion Ecologica, supported by Alberto Acosta when he was Minister for Energy and Mines in 2007. The pledges for the compensation fund never exceeded 116 million dollars while the total amount required by the Ecuador Government was of 3.600 million dollars. As a result, on August 15, 2013, president Correa announced oil extraction in the ITT (Ishpingo-Tambococha-Tiputine) block, blaming foreign governments for not coming up with economic contributions. Even though the proposal never materialized it still created a momentum. Since the case became well known internationally, it represents an antecedent for social movements. There are many attempts at "yasunizar" other territories, and leave shale gas, oil, coal underground. Nationally yet, the Correa’s government abandon of the proposal definitely provoked a rupture with the countries’ social movements. In spite of the Government position shift, the Ecuadorian society continued to mobilize. Just three days after the governmental validation of oil extraction in the ITT block (18/08/2013), young environmental activists gathered under the new Collective Yasunidos. The group started a national campaign in order to collect the necessary number of signatures for the hold of a referendum concerning the future of the Yasuni-IIT. Many victims of police violence were reported during the demonstration in the defense of the Yasuni, on August 27, 2013. During the whole period of the Yasunidos campaign, the harassment of the members of the collective became common. Police investigations were carried on several members of the collective. Another striking example was the abusive arrest of David Mármol in May 2014, after showing is thumb down as a sign of disapproval of the oil drilling project. Nevertheless, the collective said to have gathered over 600.000 signatures, the necessary number to propose a referendum. It presented the signatures to the Consejo Nacional Electoral (CNE; National Electoral Council) by April 2014. On May 6th 2014, the initiative was invalidated by the CNE which only recognized 359.761 signatures out of the 757.000 presented. Irregularities in the procedure were reported by the activists but no judicial procedure followed up. A few weeks later, on May 23rd, Petroamazonia company was granted a permit for exploration in the national park. The company was expected to start its activities in the course of the year 2015. On October 21st 2015, Yasunidos submitted a letter to the National Assembly President demanding to the legislative Chamber to retract on the declaration claiming that the exploitation of oil in Yasuni –ITT is a national interest. The request wasn’t fulfilled. Project Details The park is divided into 6 different lots (blocks 14, 15,16,17,31 and ITT) with 8 oil concessions. In block 31 there was a reserve equal to 69 million barrels. It was built a 300 km pipeline to carry the crude oil to Agrio Lake. Subsequently, they would build 142 standard wells and 17 injection wells. In the block ITT, Petrobras planed to extract from 2006 onwards 65,000 barrels a day of heavy oil. But then came the ITT initiative from 2007 to 2013. An estimated 846 million oil barrels would be left untapped thanks to the Yasun ITT project. The oil extraction on the block 15 has polluted 4 protected areas, damaged 28 indigenous communities and 22 rural communities. Other Seismic exploration on 250 000 hectares. Development of Alternatives The complete stop of the oil exploration and extraction in the Yasuni National Park, and the restoration of the area. Campaign for way out from extractivism, as the slogan "yasunizar" suggests. Call for a referendum about the ITT oil exploitation, which was accomplished by the Yasunidos coalition, and the recognition of people's voice. Why? Explain briefly. While the extraction in Block ITT was stopped by the Ecuadorian government until 2013 only, the other blocks in the Yasuni National Park have continued their activity, affecting and violating human rights of other non-contacted communities. The popular call for a step out from the national progressive extractivism did not find support from the government. Martin, P.M. (2011) ‘Global Governance from the Amazon: Leaving Oil Underground in Yasuní National Park, Ecuador’, Global Environmental Politics, 11(4), pp. 22-42. Detras de la cortina de humo. Dinmicas sociales y petroleo en el Ecuador. Bustamante, Teodoro. Ed. Flacso. 2007. The demise of the Yasuni initiative, Arsel M., Pellegrini, L.